Here, the mild leaves of lamb's lettuce and the rich, creamy flesh of avocado are the perfect backdrop to the fresh flavours of coriander, mint and delicately oniony chives. This is delicious on its own as a starter, or with griddled prawns or cold chicken. 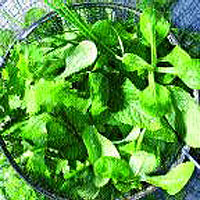 Tip the lamb's lettuce into a serving dish. Scatter over half the herbs and gently mix into the lettuce. Peel, stone and cube or slice the avocado and arrange over the leaves. Whisk together the lime juice and avocado oil and season well. Drizzle over the salad. Finish by scattering over the remaining herbs. Serve straight away. Many herbs discolour after chopping, especially basil, rosemary, mint and chives, so leave slicing till the last minute. This is worsened by being chopped when wet, so wash and spin dry before use. Chopping drastically reduces the volume of herbs, and releases their aromatic oils, so 1 tbsp chopped thyme will pack a lot more flavour than 1 tbsp unchopped thyme. As a guide, a 20g pack of fresh herbs will yield 4 tbsp chopped, while an 80g pack will yield 10-12 tbsp. The more mature the herb, the stronger the flavour. You can now buy fresh herb seedlings: very young herbs that have a very delicate taste and are ideal raw in salads or sandwiches.